This project is a collection of oil paintings produced during and after a year of travel. Dozens of small paintings serve as studies of people, animals, and environments painted plein air in 7 countries. Highlights of the show are 4 larger, surreal oil paintings that are evolutions of these observations into more illustrative pieces, which express deeper issues and feelings surrounding these places. By viewing this work the audience follows a narrative that creates a link to something otherwise distant, and perhaps will be moved to explore that connection further. The exhibition was held in the Palette and Chisel in downtown Chicago. Though the majority of the paintings were produced as observational studies from life while traveling, the four large paintings were produced in Chicago as a response to impressions I formed that particularly moved me. These paintings were each attached to a charity in their represented country that received a donation from their sale. To inquire about available artworks from this project, please contact me at LCatherwood@gmail.com. This piece is a reaction to the problem of unexploded ordnance in Laos. Though the US was not officially at war with Laos during the Vietnam war, between 1964 and 1973 over 2 million tons of ordnance were dropped over Laos, and approximately 80 million submunitions (called “bombies”) remained as unexploded ordnance after the war. More than 20,000 people have been killed or injured by this UXO since the war ended, 40% of these people being children. The rural poor who already struggle to feed their families have to do so while worried that they may die or become disabled while digging their fields or preparing a cooking fire. The woman in this painting seeks to protect her children. Though she cannot see or run from what cripples her, she must persist with the powers she has. Hmong women weave flower shaped hats for their babies to disguise them from malicious spirits from above, and this threat comes from above and waits below. She plants her babies in this very same soil where she must dig for their nourishment, wrapped in her potent textiles, hoping for the best as death grows from the wild earth all around. With the sale of this painting, a donation was made to Mines Advisory Group, which saves lives through the painstaking manual demining of land. For more information, please see MAGinternational.org. While in Cambodia, I was fortunate enough to view paintings and performances by some very talented young people, who admirably pursued their crafts despite difficulties due to economic hardship. Something continuously noticeable in this work was a pattern of haunted ambiance. These pieces involved ghosts, nightmares, and darkness. Any Cambodian walking the streets today over the age of 40 lived through the genocidal reign of the Khmer Rouge. Cities were depopulated and the entire population was forced into rural labor camps where 25% of Cambodians died due to famine, torture, and rampant executions. Any cultural artifacts were destroyed and even hospitals, schools, and banks were closed and raided. Healing a nation after this enormous tragedy has been slow going, and the impoverished country struggles to offer education and resources to this day. The boy in this painting crouches next to the bird cage he uses to make money for his family. He looks up to see the ghosts of Cambodian farmers, their wings clipped when their freedom was taken from them, their pain still haunting the boy’s surroundings. The cities in Vietnam are beautiful and chaotic, piled with buildings appearing to climb over each other, streets packed with loud motorbikes. The energy is thrilling and the sensory feast is overstimulating. One drawback to the growing urban population is air pollution, which has been rising to grave levels. It is one of the major causes of the high mortality rate in Vietnam. Cleaner energy and travel options are necessary to support these growing cities. With the sale of this painting, a donation was made to the International Climate and Energy Project of the Sierra Club. For more information, please see SierraClub.org/international. Traveling through Indonesia, the surrounding environment feels aggressively alive, a teeming force. The Balinese people live in the throes of this wild nature, and hold animistic beliefs that involve continuously making offerings to abide the spirits. There is not only the lush and tangible side of things, the sekala, but also the unseen yet powerful side, the niskala. The people are part of the ongoing cycle, being given life by the richness of the forest and being consumed by it, on and on. Indonesia’s rainforests are one of earth’s most biologically rich landscapes, home to 10% of the world’s mammal species and 11% of plant species. Sadly, Indonesia has one of the highest deforestation rates in the world, and just under half of the country’s original forest cover now remains. Burning areas clear for commodities results in extinction, human rights abuses, loss of indigenous communities, release of carbon sequestered by the trees and peat moss, and an annual haze of smoke that causes a public health crises across several countries for weeks at a time. With the sale of this painting, a donation will be made to the Conservative Action Fund of the Rainforest Trust to help stop deforestation. For more information, please see the Sumatra Wildlife project on RainforestTrust.org. 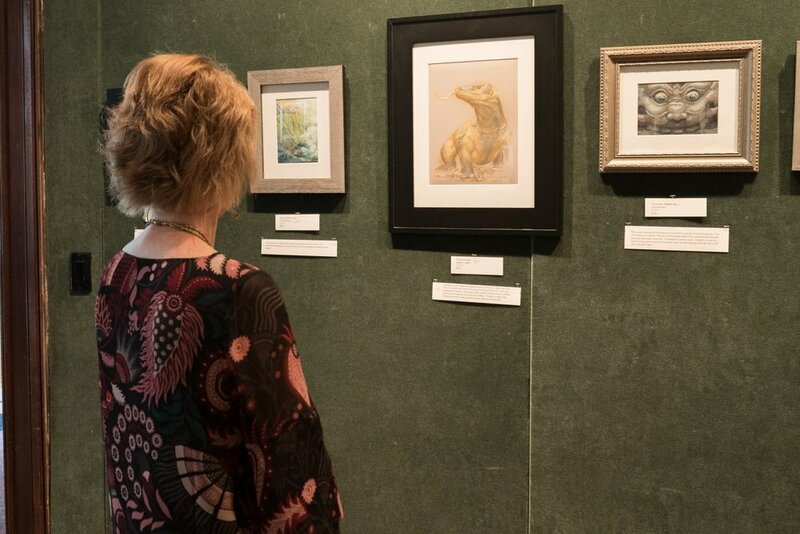 I am immensely grateful to the Illinois Arts Council Agency for their generous grant that made this exhibition possible, the Palette and Chisel for their beautiful space and warm community, the volunteers who assisted with hanging the show, and everyone who attended. I am also forever grateful to the many kind people I met on my trip who offered me company, places to stay, and subjects to paint. Thank you!